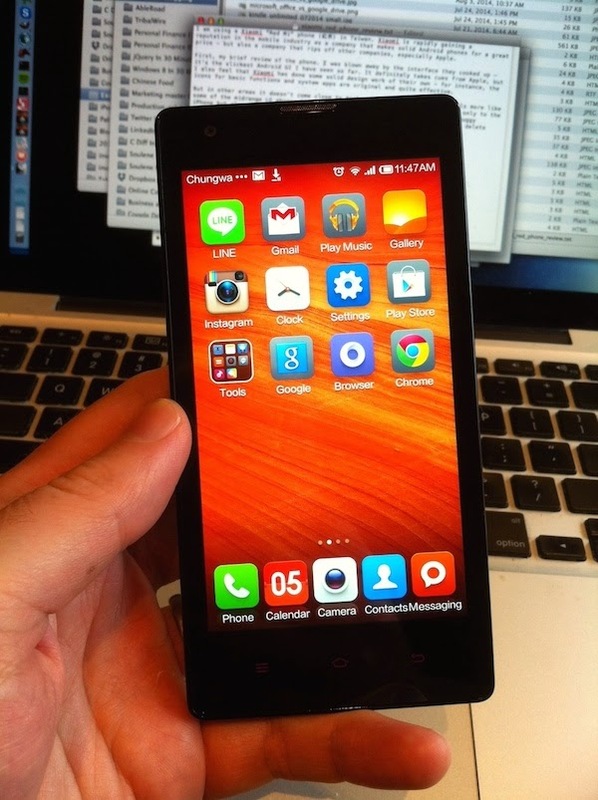 I am using a Xiaomi "Redmi" phone (紅米) in Taiwan. Xiaomi is rapidly gaining a reputation in the mobile industry as a company that makes solid Android phones for a great price — but also a company that rips off others, especially Apple. First, my brief review of the Redmi phone. I was blown away by the "Miui" interface they cooked up — it’s the slickest Android UI I have seen so far (scroll down to see an image). It definitely takes cues from Apple, but I also feel that Xiaomi has done some solid design work of their own — for instance, the icons for basic functions and system apps are original and quite effective. But in other areas the Redmi doesn’t come close to Apple. The hardware looks and feels more like some of the midrange LG phones I’ve used in the past, and compares poorly not only to the iPhone but also recent Samsung and HTC phones. I’ve also discovered a lot of buggy behavior that I’ve never seen in any Android device, including an inability to delete photos (the dialog reports I don’t have permission) or apply system updates. I have spent about an hour trying to fix both problems and searched online for solutions but so far there is no help to be found, meaning that I now have to carry around my U.S. iPhone to take photos. In addition, a buggy dictionary combined with a poor virtual keyboard means that many of my texts are filled with typos and unwanted periods. If Xiaomi doesn’t improve the hardware and fixes bugs like this, I predict that the “Xiaomi is copying Apple” complaints will eventually die down. But in the meantime, it’s interesting to see a Chinese device manufacturer rise to such prominence, especially after Taiwanese companies (Acer, HTC) struggled. I really hope Xiaomi gives Samsung and Apple a run for their money, because competition boosts innovation while keeping prices down.